In “Mockingbird,” Tyrion demanded a trial by combat once he realized just how high his father Tywin had stacked the deck against him. But he sours on the idea when both Jaime and Bronn decline to be his champion—they like being alive much more than they their odds against Gregor “The Mountain” Clegane. Tyrion’s prospects are grim until Oberyn Martell, who’d just been serving as a judge at the trial over Joffrey’s murder, volunteers his services. He fights a good fight in both senses of the word: not only is he athletic and skilled with a spear, but he has a just cause for entering the arena—to avenge his sister and her children, who were killed by The Mountain. We all know how this played out; even when the episode first aired, the conclusion seemed a foregone one. The bisexual prince of Dorne was better known in King’s Landing for his time spent in brothels than his ability with a sword. In the lead-up to the fight, we saw Gregor making julienne out of his sparring partners while Oberyn opted to drink wine and wear leathermail. Size differences aside, The Mountain was a one-man battalion while Oberyn was an unknown quantity. But as their fight raged on, Oberyn spinning deftly away from Gregor’s swings, it took on a different, but still familiar, light. For a moment, we were transported to the valley of Elah, watching David take on Goliath—what Oberyn lacked in size and armor, he made up for in speed, accuracy (for a while), and conviction. To paraphrase Abraham Lincoln: right, aided by a poison-tipped spear, makes might. Suddenly, the odds looked good for both Oberyn and Tyrion—at least, for non-book readers. Five years, dozens of named character deaths, and one pulverized skull later, it seems almost silly that we (again, non-book readers) thought Oberyn had a fighting chance. But David Benioff and D.B. Weiss’ script creates a significant amount of tension, which Alex Graves’ direction stretches to a breaking point in the fight scenes. 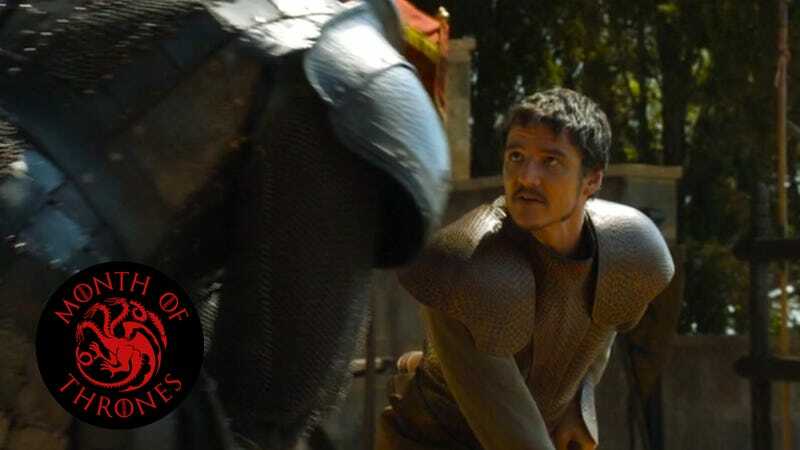 Credit Pedro Pascal’s performance, too—the Red Viper and his search for vengeance are just background in George R.R. Martin’s books, but on screen, Oberyn has a magnetic and galvanizing presence. As a Dornishman, he refuses to play along with the self-contradictory social norms of the Westerosi, speaking openly of his expansive view of love and desire. In fact, at Joffrey and Margaery’s wedding, he’s the only one that mentions the L-word without a sneer. 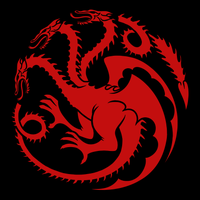 The Lannisters had run roughshod over everyone else all season, so viewers were anxious for a champion to stand up to them, even though the show’s history had already amply demonstrated what happens when someone goes against the lion. Oberyn’s motivation made him sympathetic; his combat skills made him a contender. The real shock in “The Mountain And The Viper” isn’t delivered with that final punishing blow (or should we say “pop”) to Oberyn’s head—it’s the realization that the audience thought the fight would end any other way. Daenerys and Jorah’s time together is at an end for now, as she learns he was spying on her earn a royal pardon. It doesn’t matter that he quickly had a change of heart and foiled an assassination plot, or that the document Ser Barristan waves around is a forgery of the real thing crafted by Tywin, who used it to destabilize Dany’s growing power. Dany’s not angry, she’s disappointed—so much so that she won’t allow even Jorah’s corpse to reside in Meereen, so she just exiles him. There’s another near-miss for the Stark sisters, who don’t realize they’re both in the Vale at the same time. The death of their aunt Lysa means Arya is denied yet another refuge—Maisie Williams’ laughter manages to be both grim and bubbly when the soldier offers his condolences—while Sansa emerges from Littlefinger’s trial as a real player in the game of thrones. On the battlefront(s), the wildlings raid Mole’s Town, but Ygritte spares Gilly and her baby. And with the help of Theon cosplaying as Theon, Ramsay sacks Moat Cailin and becomes a real (Bolton) boy.